Character actor Alex Rocco has died, according to a post on his daughter’s Facebook page—and then reported by Variety. No cause of death has been given. Rocco was 79. Though he’s probably still best remembered for his role in The Godfather, Rocco was a popular character actor who had been consistently getting work since the ‘60s. His IMDB page lists over 160 credits, so even someone who doesn’t know his name probably knows his face, and they definitely know his gravelly voice—which made his handful of jobs as a voice actor instantly memorable, from Thorny the ant in A Bug’s Life to Roger Meyers Jr. on The Simpsons. Rocco was born in Massachusetts, and as a young man he became loosely involved in Boston’s organized crime scene and eventually ended up in prison. As he explained in this classic Random Roles interview, he decided then that he would “never be locked up again,” so he got out of Boston, moved to California, and enrolled in Leonard Nimoy’s acting class. Though Rocco said that he “wouldn’t spend five bucks to see Leonard in a film,” he was still “one of the greatest coaches” he had ever had. In the ‘60s, Rocco appeared in a few movies and had small roles on a number of TV shows—Batman, Get Smart, That Girl—but his real big break came in 1972, when Francis Ford Coppola cast him in The Godfather. 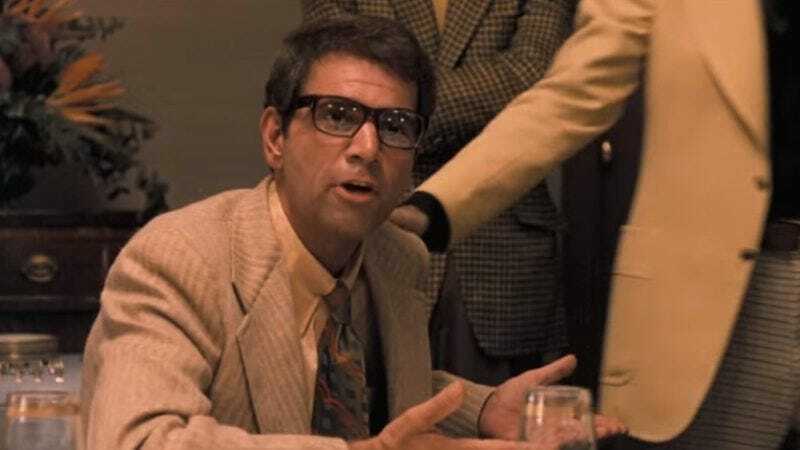 Rocco played casino owner Moe Greene—the guy who says “Do you know who I am?” to Michael Corleone and later gets shot in the eye—and in that same Random Roles interview, he said that people would still come up to him, 40 years later, and talk to him about Moe Greene or ask him to leave Moe Greene quotes on their phones. None of Rocco’s acting jobs after The Godfather were as impactful as that one—and how could they be?—but he still appeared in a bunch of things that would make his career memorable even if he hadn’t been in one of the biggest movies of all time. He had recurring roles on The Facts Of Life, The Famous Teddy Z (which he won an Emmy for), Sibs, and The George Carlin Show, plus there was his three guest appearances on The Simpsons as Roger Meyers Jr., the son of the creator of Itchy and Scratchy. He also appeared in films like That Thing You Do, The Wedding Planner, and Smokin’ Aces. In recent years, Rocco returned to his mob movie-roots, playing Carmine Falcone in the animated adaptation of Batman: Year One—a role that he admits was “for the paycheck”—and Arthur Evans on Starz’s Miami mob show Magic City. Rocco is survived by his wife, Shannon Wilcox, as well as his daughter, son, and grandson.